Love is in the air on 196 flavors! Any occasion is good to celebrate love. The bò tái chanh that I am presenting to you today takes us to Vietnam, which will celebrate the Thât-Tich festival this coming Thursday. The festival of Thât-Tich or Double Seven (7th day of the 7th month in the Chinese calendar), commemorates the unfortunate love of a cowherd (Niulang) and a weavergirl (Zhinü). He was guarding buffaloes, but he dared to fall in love with the daughter of the Jade Emperor, Yuhuang Dadi. As the Emperor discovered this love, he authorized the union of the two young people and generously gave them his blessing. But the lovers gave themselves entirely to their passion. Niulang abandoned his job as a cowherd and Zhinü as a weavergirl. This conduct caused a big anger with the Emperor and he separated the two lovers with a huge Milky Way that he built. Only once a year on the 7th day of the 7th month, he gave them the permission to briefly meet on the O Thuoc bridge built over the Silver River (Ngan-Ha) by the grace of crows. A legend says that at this time of the year, the heads of crows lose their feathers from carrying stones for the construction of the Brief Encounter Bridge. It is said that every year, during the days that preceded the Festival, the weavergirl, very happy about the upcoming rendez-vous, was working very fast and was flooding the sky with white and velvety flakes, called the virgin threads. The evening of the meeting, she would cry her ephemeral happiness, and beaded tears would fall upon the earth in the form of a fine, beneficial rain, called mua ngâu, or Rain of the Cowherd. 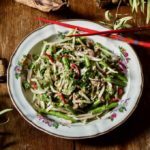 Like Mike with his summer roll recipe, I also gave in to the freshness for the summer season by proposing a bò tái chanh. 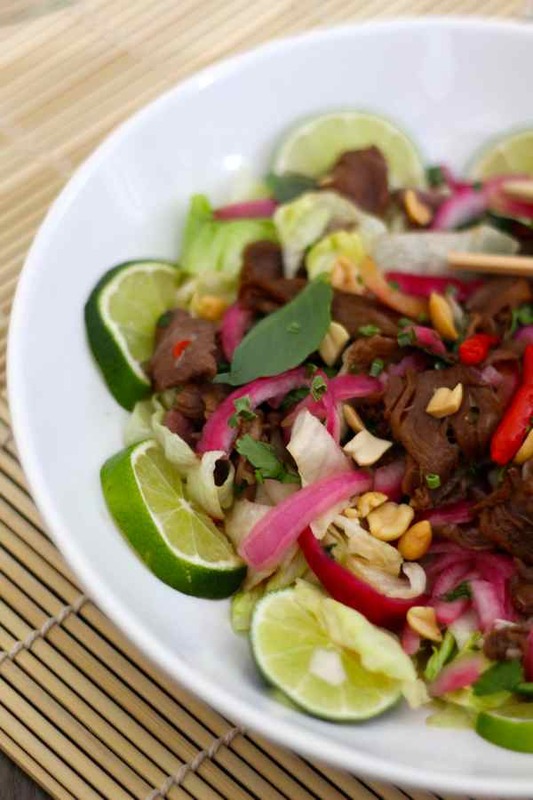 Designated as the Vietnamese beef carpaccio, bò tái chanh (bò = beef / tái = undercooked, rare or pale / chanh = lemon) is a salad based on tender beef that is prepared raw or underdone after cooking in lime juice, and garnished with typical ingredients of gỏi (Vietnamese salads) such as quintessential herbs like long cilantro aka culantro or ngò gai, rice paddy herb or rau mò om, and Thai basil or rau quế. Not to mention pickled onion, galangal, fried onion, hot pepper, everything seasoned with nuoc mam sauce and garnished with fresh vegetables. The use of rice paddy herb provides very soft and fragrant lemony notes that blend perfectly with the beef and lime. I think rice paddy herb is a great substitute for lemongrass which, even chopped, is not a pleasant texture in the mouth. 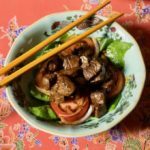 The origin of this dish that is very popular in Vietnam is actually not Vietnamese. 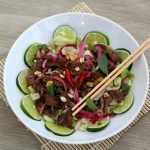 Bò tái chanh is directly inspired by traditional dishes from neighboring countries such as lap sine ngoua from Laos or beef salad also known as plea sach ko from Cambodia. 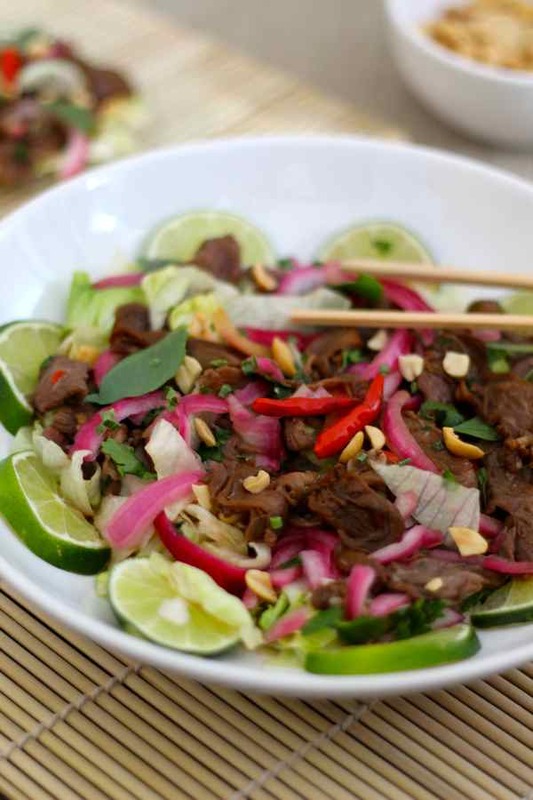 In Vietnam, raw meat consumption is not in the culinary habits of the country. 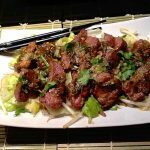 The preparation of the meat is often done with boiled beef that is marinated in lime and lightly seared. 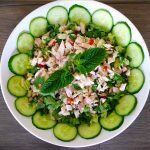 In southern Vietnam, this is a dish people enjoy as an appetizer called ăn nhậu ( ăn = eat / nhậu = drinking alcohol), and it is generally reserved for men. This was not the first time I cooked Vietnamese. 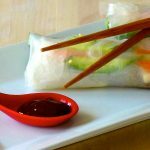 I made the famous bánh mì last year and, like bánh mì and Asian cuisine in general, I absolutely loved bò tái chanh. I served it as an appetizer to my friends on my terrace a few weeks ago when the thermometer was above 100 F in Paris except that… there were women too! 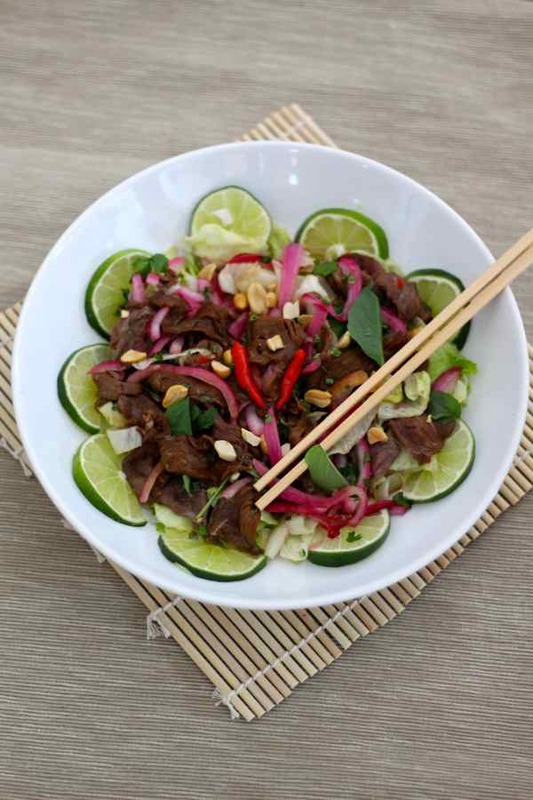 Bò tái chanh is a Vietnamese salad based on beef that is prepared raw or underdone by cooking it in lime juice, and served with other herbs and ingredients. In a bowl, pour 2 tablespoons of rice vinegar. Add 1 tablespoon of sugar and 1 teaspoon of salt. 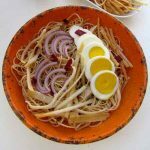 Mix well until sugar is completely dissolved and add the red onion slices. Mix and marinate for 45 minutes. After marinating, press the meat between your hands to drain excess juice. Put the meat in a dish. Pour 1 tablespoon of fish sauce. In a small saucepan, heat oil and fry the garlic on low heat a few seconds. As soon as the garlic begins to brown, remove the pan from the heat and pour the fried garlic and the oil in a bowl to stop cooking. Add fried garlic to the meat and mix well. Add 1 tablespoon sugar, ½ teaspoon of salt and ½ teaspoon of ground white pepper to the meat and mix. Add herbs, galangal and hot pepper to the meat and mix well. Separately, crush peanuts coarsely. Set aside. Make a bed of salad with the iceberg lettuce on a large plate. Place the beef on the salad. Sprinkle with crushed peanuts and shallots. Add a few slices of pickled red onion. In a bowl, mix 2 tablespoons of brown sugar with 6 tablespoons of hot water and dissolve completely. Pour the rice vinegar, lime juice and fish sauce. Add garlic and hot pepper. Drizzle sauce on bò tái chanh.